possible violent reaction. Communication between the redi-mix operator, hopper watch person and the pump operator is critical to prevent this from occurring. Thorough cleaning is essential. A hose or pipe that has not been cleaned thoroughly will reduce the ability of the concrete to flow smoothly and may cause a plug. Proper mix design and proper mixing are critical for pumping concrete. Debris from the redi-mix truck (barrel, chips, oversized aggregate) can get into the system and cause a blockage that results in plugging. Extreme caution must be taken whenever a system plugs. If a clamp is removed before the operator backs off the pressure, there can be a violent release of concrete straight up at the person performing the task. Good communication is the key when the system plugs. A clamp should not be loosened until there is a verbal verification from the operator that the pressure has been backed off. Then – and only then – is it safe to remove the clamp. 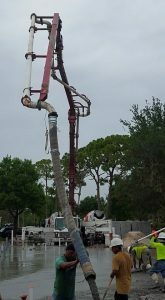 Kinks in the hose line will prevent the continuous flow of concrete and develop a sudden increase of pressure that can react violently when released. The number of yards per hour to be pumped. Ease of use for the hose operator.Be aware, reducing the hose size will increase pressure and could cause plugging. 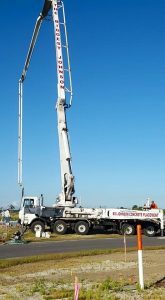 Redi-mix company and concrete pumping company regarding the delivery and status of trucks. Ensure a clear line of sight between the redi-mix driver and pump operator/hopper, watch to ensure operator safety while trucks are backing in and pulling out. To maintain the proper level of concrete in the hopper, how to activate the emergency stop alarm on the truck when a problem arises and the location of the emergency stop switches. Between the pump operator and the placing crew. Pre-pour planning is critical for ensuring a pour goes as planned without unnecessary interruptions. Jobsite conditions such as soil conditions, ground preparation,overhead electrical power lines, adequate access and egress into the location, redi-mix truck staging areas,traffic control (flaggers), etc., need to be taken into consideration long before the concrete arrives.Any of these conditions, if left unchecked, can greatly affect the safe operations of placing concrete. It is recommended that before any concrete pour begins, the following items be checked off to ensure a safe start to your concrete placement operations. Person in-charge (PIC) has been identified. Power lines have been de-energized or relocated to prevent accidental contact. Pump operators must have 17 feet clearance away from all energized power lines before operations can begin. Adequate access and egress routes for crew and equipment have been established. Flaggers are assigned for traffic control. A staging area has been established for redi-mix trucks. 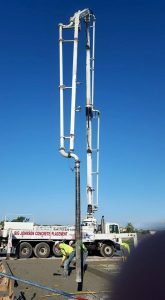 Whenever possible, a level setup area should be established for the pump truck and redi-mix trucks. A clean out area is available for the pump truck and redi-mix truck. Soil conditions will support the weight of the pump truck and redi-mix truck. Adequate lighting has been established. Effects of adverse weather conditions on personnel and operations have been considered. Working with freshly mixed cement products such as concrete, mortar or grout can cause injury to the skin and eyes. Caution must be taken to limit exposure to these areas. By reading and understanding the MSDS on the product and following these simple precautions, needless injuries can be prevented. Keep cement products off your skin Wearing personal protective equipment such as rubber boots, gloves, and impervious clothing and knee pads will protect the skin from prolonged exposure to cement and prevent skin irritations. Do not let skin rub against cement products Many cement products are abrasive. Continued rubbing increases the risk of skin irritation and injury. Wear protective clothing to prevent any unnecessary chafing of your skin. Wash skin promptly after contact with products containing cement Avoid contact with skin where possible and wash exposed skin promptly with water. Limiting the time of skin contact will greatly reduce risk of exposure and injury to your skin. Keep cement and cement products out of eyes Eye protection such as safety glasses must be worn whenever you are working with cement. Exposing the eyes to cement can cause serious injury. If any cement or cement mixture gets into the eyes, continuously flush with water and consult a physician or call 911 promptly. Do not breathe cement dust Cement contains crystalline silica. When working with dry cement such as preparing grout or adding dry cement to a redi-mix truck, respiratory protection should be used. The will prevent inhalation of these fine particulates. Keep out of reach of children Keep children away from cement powder and all freshly mixed cement products. Wearing soiled work clothing into your home can expose your family to cement dust. Any accidental ingestion of cement must be dealt with promptly by consulting by the first aid measures of you MSDS and contacting POISON CONTROL at 1-800-732-6985.